Director-designer John Doyle does not hold with decoration. His productions at Classic Stage Company, where he’s also the artistic director, are much-with-little, no-fuss poor-theater affairs; if the actors get a table to play with, you count them lucky. 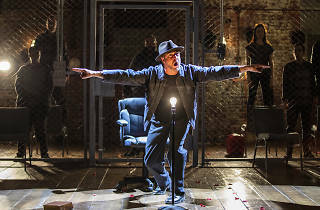 This turns out to be a tricky and sometimes self-defeating approach for Bertolt Brecht’s half-gorgeous The Resistible Rise of Arturo Ui, his 1941 mash-up of a Hitler allegory and Shakespeare’s Richard III. Brecht’s ultra-dense text is packed with allusion, quotation and wordplay, and even in a cut version it’s a massive meal to digest. (George Tabori’s translation, a blend of '30s Chicago-ese and Renaissance folderol, is itself a masterpiece.) Doyle’s production is certainly streamlined, and it boasts a wonderful Ui—Raúl Esparza plays the part just at the edge of clowning—but his directorial choices also make this character-crammed epic harder to understand. The nearly costume-free company doubles and triples roles: Someone will throw on a hat to become a victim, then fling it right off to become a murderer; everyone talks as fast as they can. Due to a quirk of fate and former employment, I happen to have seen Brecht’s play about 50 times, but even I got confused—and this is the kind of ride that’s hard to get back on once you’ve fallen off. Happily, most of the players are extremely strong, especially Omozé Idehenre and Mahira Kakkar, who make their multiple roles shine. The headline, though, is Ui, Ui, Ui, and no one really comes close to Esparza, who whiplashes between moods. He goofs around like a kid, plays broad, whacks the role with some commedia shtick—and then, when he decides to be menacing, he electrifies the room. 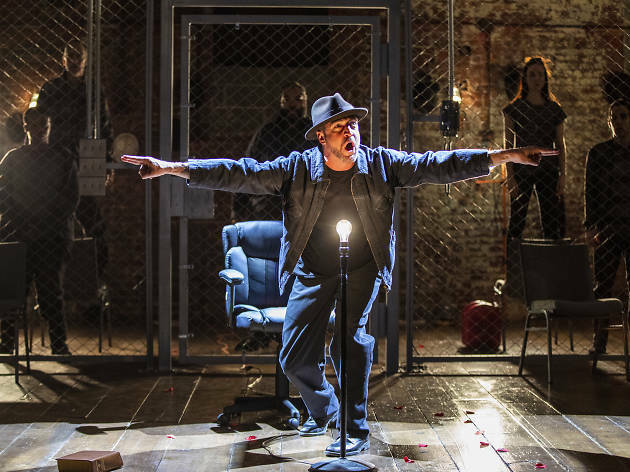 The play weakens in the second half, when Brecht leans so heavily on Richard III that his own play cracks, but I’d still recommend it. So much of this difficult, angry play is actually a great entertainment: the tommy-gun dialogue, the sound of Brecht's allegory snapping past you, the highfalutin Shakespeare puns. And, of course, Ui. You laugh at him, you fear him, you realize you know him. You certainly can't resist him. Classic Stage Company (Off Broadway). By Bertolt Brecht. Translated by George Tabori. Directed by John Doyle. With Raúl Esparza. Running time: 2hrs. One intermission.